Besides having a really cool name, Montel Intergalactic is also a cool company to work with. I met one of their engineers in an OpenEBS Slack forum and explained to him what I was up to. The next thing you know within a week we had everything setup at Hetzner. All Montel wanted in return was this humble blog post. A note to others in the space, THIS is how you build customer loyalty and a simple gesture like this can go a long long way. Needless to say when we decide on our next vendor these guys will be at the top of the list. In fact, they'll probably be the only ones on that list (next to OpenEBS of course!). This blog will outline the detailed steps we took to achieve our goal of setting up a bare-metal Kubernetes cluster at Hetzner from scratch using Rancher 2.x - Hetzner node driver, OpenEBS, Cert-Manager, Nginx Ingress loadbalancing and the deployment of the Tutem - Hello World app to demonstrate loadbalancing and Let's Encrypt. NOTE: All nodes are created with Hetzner CX21 type servers. 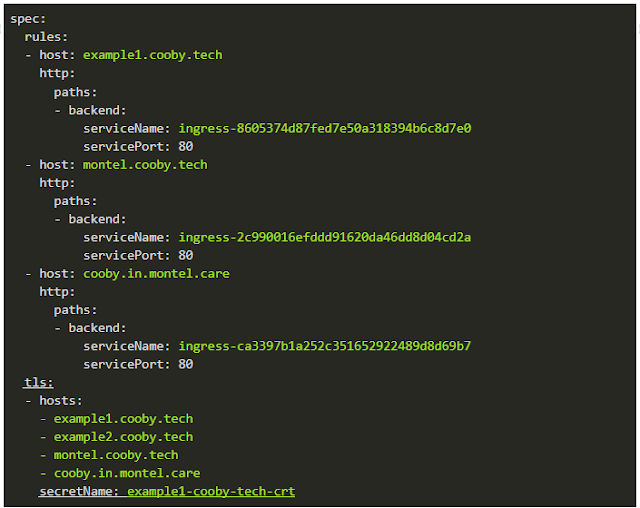 Our root domain is: cooby.tech and an "A" record called rancher.cooby.tech points to the instance IP. curl https://gist.githubusercontent.com/gridworkz/d78c290c4e6fd7753dc21bb50601745a/raw/625fc3b7ddb7a654fe379f67d0bb9c6ac5b9413a/InstallDockerCompose | ssh -i ~/.ssh/<privkey> root@rancher.cooby.tech "/bin/bash -s"
Schedule pods so that they are not running on a node with tag loadbalancer. This is not a hard requirement, but in our example cluster it really makes sense. example1.cooby.tech and to use nginx ingress to route it to the example1 workload. Also in the DNS server you can do, for example, cooby.in.montel.care CNAME montel.cooby.tech and again use our nginx-loadbalancer to route cooby.in.montel.care to your desired workload. 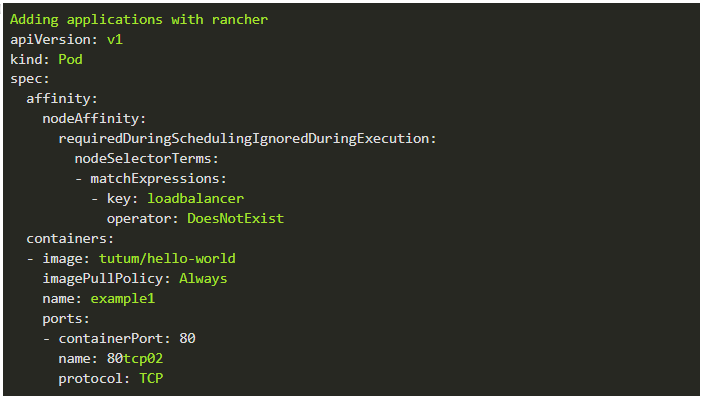 The simplest way to add Let's Encrypt in Rancher is to install it via catalog apps. Will be automatically handled by Let's Encrypt. The first time you add an ingress you have to give the certificate a name by editing YAML and adding only the underlined parts below. Other ingresses can be added within the Rancher UI. This will create a persistent volume claim named demo-vol1-claim with 10Gb of space in the storageClass: openebs-jiva-default. This storageClassName can then be passed as a parameter to various applications that require persistent and scale-able storage. In this blog we set out to build a simple Kubernetes cluster on Hetzner server instances. The goal was to put together an introduction to building Kubernetes from scratch by using some of the great tools that are out there that make this process simpler. This should act as a good foundation for any development or POC system. In fact, we use this setup over at Cooby Cloud. With the goodwill gesture from Montel Intergalactic I was able to get this up an running within a week. Hats off to them and the great folks on the OpenEBS Slack channel. Next up in this series I'll demonstrate how to install Postgres and Odoo on top of this design utilizing some of the wicked tools over at XOE Solutions.